Cancer Research UK's Therapeutic Discovery Laboratories (CRUK-TDL), formerly CRT Discovery Laboratories, is the in-house CRUK drug discovery unit with a principal focus on establishing and prosecuting biologically-themed multi-project alliances with industry. Based at the Babraham Research Campus, Cambridge, and the London Bioscience Innovation Centre, TDL comprises over 80 staff from both industrial and academic backgrounds. Our expertise spans cancer target validation and disease positioning, assay development and HTS, protein crystallography, medicinal chemistry, PK-PD and cancer models. Through our alliance approach CRT-DL aligns these key skills with internationally competitive academic research and the development capabilities of industry partners to maximise cancer patient benefit. CRUK-TDL has an exclusive focus on establishing and prosecuting biologically-themed multi-project alliances with industry. We bring together the best minds in basic and clinical cancer research, the rigour and drive of pharmaceutical and biotech companies, and our in-house drug discovery and alliance management capabilities to deliver breakthrough medicines for cancer patients. 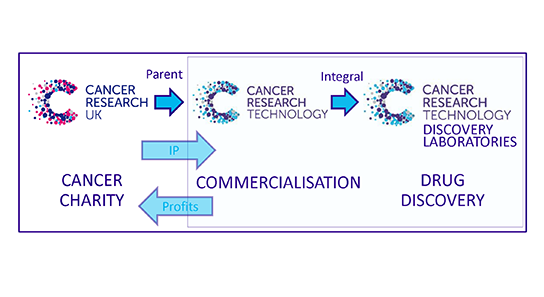 We’re uniquely placed to capitalise on the research and connections of our parent organisation Cancer Research UK, the world’s largest charitable funder of cancer research, and the strong links we’ve established with leading clinical and academic institutions, pharmaceutical companies and biotechs worldwide.